Brexit was an interesting campaign to watch, and there’s not too much I can add that hasn’t been stated already. 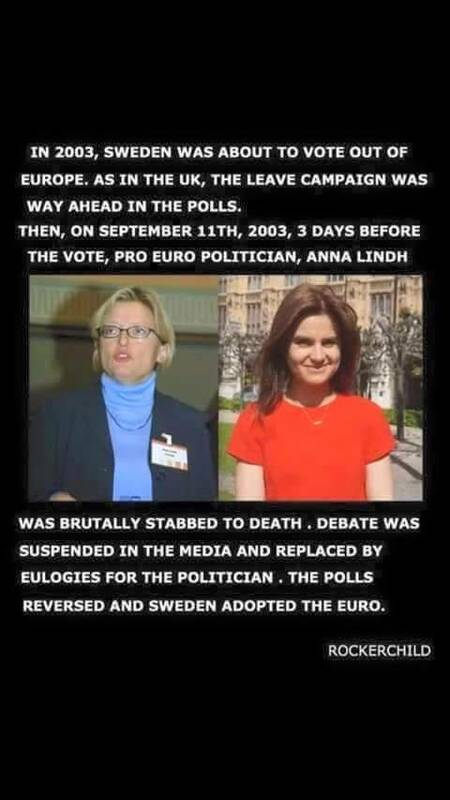 I saw some incredibly fake arguments from Brexit supporters, including one graphic drawing a parallel between the assassinations of Anna Lindh in 2003 and Jo Cox MP, saying how the murder of the former led Sweden to remain in the EU. The trouble with the graphic is that the only thing it got right was that two women were killed. Sweden wasn’t having a referendum on whether to leave the EU, it was about whether it should adopt the euro. The closest British parallel would have been when then-PM John Major negotiated the Maastricht opt-out in 1991. It also claimed that the polls were for leaving; notwithstanding that that wasn’t what the Swedes were voting for, the polls for and against adopting the euro were roughly neck in neck, though the wisdom was that the pro-euro camp would win. By the weekend, the result was that Sweden would keep the krona. When I argued with some pro-Brexiters about this, they, like most pecksniffians, demanded I check my facts. I didn’t have to: I have a memory that goes back further than one month, and unlike them, I know what went on in their own backyard because, in 2003, I kept my eyes open. I should point out that I am not summarizing all Brexiters as dimwitted Britons who wanted Johnny Foreigner to go home. I count among my closest friends someone who voted leave, and for very substantial, well thought-out reasons. He felt that the European Union had become an unwieldy bureaucracy which benefited Britain little, and while I felt the benefits outweighed the detriments, I respect his opinion and his vote. At least it was considered, and at least it wasn’t one that was based on the ramblings and rants of Farage, Johnson, Gove et al. Appealing to nationalism, as the likes of Farage did, is a cheap trick in politics: it stirs a wave of nostalgia, and people might love chanting at how great their nation is, but it doesn’t address the core issues that put them into the poo to begin with. Of course the UK has a great deal to be proud of; but like many countries (including ours) the globalist technocratic agenda are what have made things untenable for a growing part of the population. It’s why real wages haven’t risen yet certain corporations profit aplenty; it’s why we work more hours today than we ever did, despite futurists of a generation ago predicting all this leisure time that we would all have thanks to automation. But is retreat the right thing to do? The remain camp believes that it wasn’t: to influence Europe you must be in Europe. It wasn’t that long ago that not being in Europe was fatal to British exports—the failure of the British motor industry, for instance, was in part due to its late recognition that the UK needed to be part of the EEC or, at least, produce vehicles there. Globalization’s positives should be the free movement of people and of capital; and economic union to permit that greater freedom seems a sensible thing to pursue, not to run away from. The trick is how to make this work for everyday people, the growing number who are impacted by globalist forces; once there were few, now few escape them. It is, then, the role of government to either protect those who are most vulnerable, to champion (either through private enterprise or on its own accord) real innovation and industry that can create jobs, and to cut through the BS where both public and private enterprise simply reinvent the wheel from time to time, putting lipstick on the bulldog. I am ambivalent about it because I’ve seen our own governments, National and Labour, be particularly weak when it comes to dealing with globalization, succumbing to foreign takeovers and allowing the little guy to be run over. The deals haven’t been good for New Zealand in many respects, a small country that believes in its place in the first world but which can be deluded about this very fact. Our economy just isn’t that solid to take it on the chin. Look at our banks, mostly foreign-owned and more unreliable than ever: remember how 40 years ago cheques would take 24 hours to clear? Yet now our computerized systems take three to five working days? Insiders tell me this is the consequence of less reliable Australian systems being foisted upon us; so much so that we have a wire transfer that has been taking weeks, and no one knows where the money has gone. Just how do you misplace tens of thousands of dollars? Why do we assume Australian bankers are smart enough to answer? And those who question such agenda don’t get much truck in a media landscape also dominated by foreigners: I’m looking at one newspaper publishing group at the least. The ways of the big countries are not always the best—yet somehow the powers-that-be in this country have been hoodwinked by this consistently since 1984. I can’t understand it, and my initial reaction when there is such a lack of logic is to follow the money. Brexit has made me refine my thinking: I might not like a system where New Zealand’s the little player that doesn’t benefit from a level playing field, but at the same time I believe we need to find ways to influence the globalist game for the better. We love looking at Scandinavian countries because of their comparable size. They may have higher taxes but at the same time they don’t seem to balk at innovation for the greater good; they believe in the freedom of movement of capital and of people, and, despite their general humility, they actually aren’t afraid of creating global companies that take on the rest of the world. Look at Vattenfall or Statoil. We might not like Statoil for what it wants to do to our own environment, but we do have to ask what our equivalent is. We lost our lead in hybrid cars, which we held for most of the 1980s, but it’s an example of what we can do when government and private enterprise cooperate on something that is future-oriented. What’s the next big thing? Is it renewable energy tech that we can export? There are companies here already doing frictionless exports, and more need to be encouraged. Government shouldn’t try to create groups of them or force mergers upon them; that can be left to the market. But there needs to be a vision or a direction that we take to create a new brand for our country where people naturally think: innovation for the greater good = New Zealand. And, maybe, to go with that, a fairer version of globalization can emerge, certainly one that is not coloured by the next quarterly result demanded by Wall Street. Yes, there is some national fervour involved here, too, but applied correctly, it won’t be false flag-waving that’s dependent on the past. I’m all for being proud of your country when the victories are real and measurable—like on the sporting field. There it’s real, and it’s often about the next game or the next season: it’s future-oriented, too. With Brexit, I can’t see the vision; and the most visible foreigner among this, the Turkish-American politician, Boris Johnson, hasn’t communicated one that I can discern. And maybe this confusion is the opportunity we need for New Zealand. After the UK abandoned the Commonwealth markets in favour of one right next door, our country found new export markets, so much so that the UK accounts for 3 per cent today. Even in 1973, when it was 40 per cent, it had been falling consistently for half a decade, if I recall correctly, and the notion that Britain would reach back out toward the Empah for trade is fanciful at best. Being someone who has enjoyed looking at world history play out through maps, ever since I discovered a book on the subject as a third former at Rongotai College, it hasn’t escaped my thoughts that this is a further retreat for the UK in terms of its global influence. So who’s on the rise? It might be us. The centre of the global economy has been shifting eastward in recent times and we’re well placed to take advantage of it. We’re part of the Anglosphere so we bridge the past, where it was the dominant global culture, with those trading partners who might be on the horizon. But it has to be real. We’re nimble enough, and I can’t see why we’ve been so fascinated with apeing the US and the UK for so long. Once again we need to set our own direction: we have a culture that’s ready for it with a greater sense of identity than we’ve ever had. I just wonder if we have a government, local or national, courageous enough to embark on this. 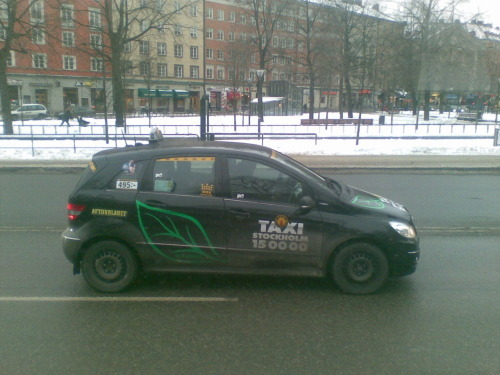 During my ﬁrst visit to Sweden, most cabbies drove Volvo S80s, S90s and 960s. A few went for Saab 9-5s. Now, the home brands share space with Toyota Priuses and Mercedes-Benz B-Klasses. Again, it’s a reﬂection of the state of the Swedish car industry, with its American owners insisting Volvo and Saab sell large cars that did not conﬂict with their offerings from their sister Opel and Ford brands. The consequence is that as the world moved to small cars, Volvo and Saab had relatively little to offer. Even the patriotic cabbies had to buy foreign. It seems Spyker realizes the folly of this policy as it takes over Saab and vows to make the company a leader in automotive environmental technology, but the compact 9-1 still does not ﬁgure in its business plan formally. Will Geely realize the same when it comes to Volvo?